This lighter-weight version of pumpkin pie has whipped cream folded in the filling and a festive gingersnap crust. 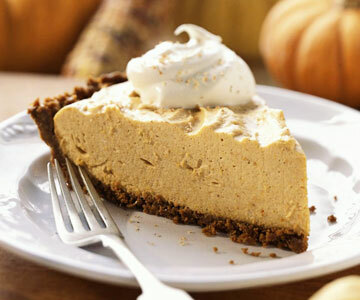 Prepare Gingersnap Crust or Baked Pastry Shell; set aside. For Filling: In a heavy medium saucepan, stir together the 1/2 cup sugar, gelatin, cinnamon, allspice, salt, ginger, and nutmeg; stir in milk. Cook and stir over medium heat until gelatin dissolves. In a medium mixing bowl, slightly beat egg yolks with a rotary beater or fork. Gradually stir about half of the hot milk mixture into yolks. Pour yolk mixture into hot filling in pan. Stir in pumpkin. Bring to a gentle boil; reduce heat. Cook and stir for 2 minutes more. Remove from heat. Transfer to a large mixing bowl. Cover and chill until the pumpkin mixture mounds when spooned, stirring occasionally (1 to 1-1/2 hours). In a chilled medium mixing bowl, combine the whipping cream and the remaining 2 tablespoons sugar. Beat with chilled beaters of an electric mixer on medium speed until soft peaks form. Fold whipped cream into pumpkin mixture. Cover and chill again until mixture mounds when spooned (about 30 minutes). Transfer the filling to Gingersnap Crust. Cover and chill about 4 hours or until set. If desired, garnish with additional whipped cream and top with pecans. Makes 8 servings. Pie can be assembled and chilled overnight before serving. Graham Cracker Crust: To make a graham cracker crust, prepare as directed for gingersnap crust except stir 1/4 cup sugar into the melted butter and substitute 1-1/4 cups finely crushed graham crackers (about 18 squares) for the crushed gingersnaps. Preheat oven to 375 degrees F. Combine butter and gingersnaps in a medium mixing bowl; toss to mix well. Spread evenly into a 9-inch pie plate. Press onto bottom and up sides to form a firm, even crust. Bake for 4 to 5 minutes or until edge is lightly browned. Makes 1 (9-inch) pie crust. Stir together 1-1/4 cups all-purpose flour and 1/4 teaspoon salt. Using a pastry blender, cut in 1/3 cup shortening until pieces are pea-size. Sprinkle 1 tablespoon cold water over part of the mixture; gently toss with a fork. Push moistened dough to the side of the bowl. Repeat moistening dough, using 1 tablespoon cold water at a time, until all the dough is moistened (4 to 5 tablespoons cold water total). Form dough into a ball. On a lightly floured surface, use your hands to slightly flatten dough. Roll dough from center to edge into a circle about 12 inches in diameter. To transfer pastry, wrap it around the rolling pin. Unroll pastry into a 9-inch pie plate. Ease pastry into pie plate, being careful not to stretch pastry. Trim pastry to 1/2 inch beyond edge of pie plate. Fold under extra pastry. Crimp edge as desired. Generously prick bottom and side of pastry in pie plate with a fork. Prick all around where bottom and side meet. Line pastry with a double thickness of foil. Bake in a 450 degree F oven for 8 minutes. Remove foil. Bake 5 to 6 minutes more or until golden. Cool on a wire rack. Makes 10 servings.